"What kind of message are you trying to send?" "Wow! Walmart reveals it's true colors and promotes POTUS45 impeachment with disgusting T-Shirt". Fox News credits Ryan Fournier, head of Students for Trump, as the first to call for a Walmart boycott on social media. Walmart has not commented on the merchandise. The company has been selling apparel from the third-party vendor Old Glory that contains the phrase, which refers to 45th President Donald Trump. 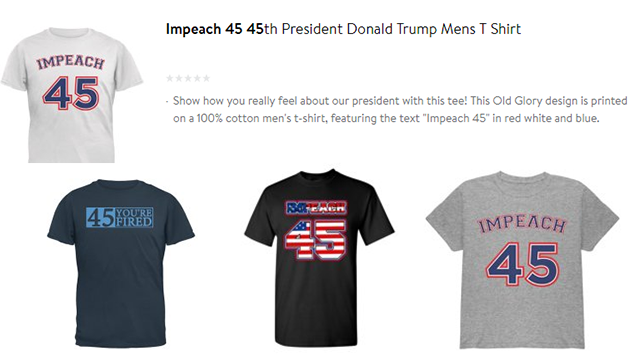 The Walmart.com marketplace is teeming with MAGA hats and coffee mugs, but the company has just pulled an anti-Trump shirt with the slogan "Impeach 45" from its website. When News4Jax searched the link the apparel was found on, it appeared to have been taken down. "We're removing these types of items pending review of our marketplace policies", a Walmart spokesperson told TIME. Walmart has caused outrage over its apparel before. Last year, Walmart came under fire for selling a shirt that read "Rope. Tree. Journalist. Some assembly required", on its third-party marketplace.